Typical fire constructed for Armstrong Events. Secure Containment Procedures SCP-4590-J is to be contained within an artificial bog, containing one specimen of Draecaena cinnabari (Socotra Dragon Tree), a mated pair of Eos histrio(Red-and-Blue Lory), a local population of Ixodes scapularis (Deer tick), and a replica of Platybelodon grangeri. Firewood and an appropriate fire circle are also to be provided. The terrarium is safe to enter and observe so long as these requirements are met. Personnel are to respectfully decline any invitation to partake in Armstrong Events. Description: SCP-4590-J is a male humanoid entity, measuring 1.51m in height. SCP-4590-J does not display any outward physical anomalies, but is notable for its mode of dress. SCP-4590 wears a cloak of deer skins and beach towels and carries walking stick at all times, and its face is obscured by a beard and wide-brimmed hat. Additionally, SCP-4590-J will always manifest covered in swamp weed and mud, and make no attempts at cleaning itself. SCP-4590-J-2 is a tribe of between 10 and 16 male and female humanoid entities1 SCP-4590-J-2 specimens will generally manifest with small possessions on their person, including waterskins, headbands, and beaded bracelets. SCP-4590-J and SCP-4590-J-2 have limited manifestation periods, occurring on Friday evenings between the first week of June and the first week of August, between the hours of 1900 and 2130. These manifestations are termed Armstrong Events, and are detailed in the log below. At 1903 hours, 12 SCP-4590-J-2 specimens (6 male, 6 female) emerged from the bog and built a fire in the fire pit. Upon completion of successful lighting, subjects remained in the area, regularly looking towards the bog in anticipation. At 1914 hours, SCP-4590-J emerges from the bog and approaches the fire circle. The following conversation is had. SCP-4590-J-2e: Oh great Japucha Master! Is it time…for Japucha? 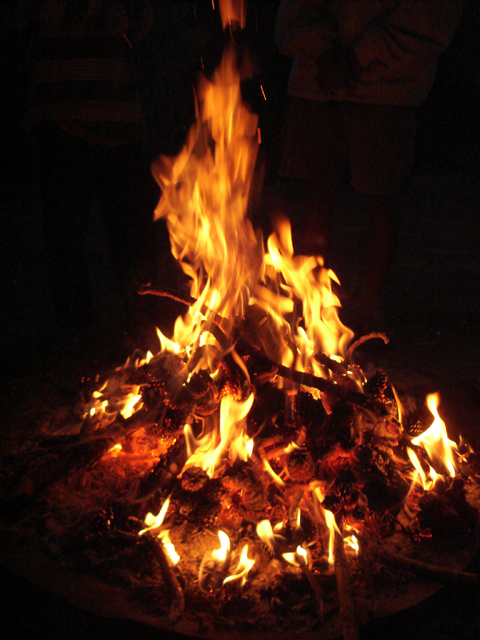 SCP-4590-J: Is it time… [turns attention to fire] OH GREAT FIRE! Which is both hot and also flickery! Is it time…for Japucha? [Pauses, listens to fire] No! No, it is not time! SCP-4590-J-2j: [Approaches SCP-4590-J in supplication] Oh great Japucha Master, who is master of Japucha. Is it now time? SCP-4590-J: Is it time, is it time…[Drops to knees] OH GREAT DIRT, which is brown and gets everything all dirty no matter how careful you are, is it time…for Japucha? [Sniffs at ground, then licks] No! No! It is not! SCP-4590-J-2a: [Approaches SCP-4590-J in desperation] Japucha Master, Japucha Master! Is it time? SCP-4590-J: Is it time? [Approaches nearby bush, grabs leaf in hand] OH GREAT SHRUB, so green and possibly poisonous…is it time for Japucha? [Tears off leaf, chews, spits out.] NOOOOOOOOOOOOOOOOOO! IT IS NOT TIME! SCP-4590-J-2c: [Taps SCP-4590-J on shoulder] Uh, Japucha Master? Is it now time for Japucha? SCP-4590-J: YES! Yes, it is time! [SCP-4590-J jumps around in celebration. SCP-4590-J specimens cheer] It is time, it is time! Come, gather, gather! Come brothers, come sisters! Let us partake of Japucha! Together: [Singing] Japucha right hand in [All put right hand into center of circle], Japucha right hand out [All remove hand from circle] Japucha right hand in and shake it all about [All put right hand into center of circle and shake] Ya do the Hokey-Pokey and turn yourself around [All spin in place] That’s what it’s all about! 1. Numbers change with each Armstrong event. Individual entities are consistent within seasons, but may change from one year to the next.